For the district, see Multan District. For other uses, see Multan (disambiguation). 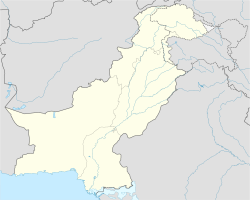 Multan (Saraiki, Punjabi, Urdu: مُلتان ‎ [mʊltaːn] ( listen)) is a city in Punjab, Pakistan. Located on the banks of the Chenab River, Multan is Pakistan's 7th largest city, and is the major cultural and economic centre of southern Punjab. Multan's history stretches deep into antiquity. The ancient city was site of the renowned Multan Sun Temple, and was besieged by Alexander the Great during the Mallian Campaign. Multan was one of the most important trading centres of medieval Islamic India, and attracted a multitude of Sufi mystics in the 11th and 12th centuries, earning the city the nickname City of Saints. The city, along with the nearby city of Uch, is renowned for its large collection of Sufi shrines dating from that era. The origin of Multan's name is unclear. Multan may derive its name from the Old Persian word mulastāna, meaning “frontier land,” or possibly from the Sanskrit word mūlasthāna, which itself may be derived from the Hindu deity worshipped at the Multan Sun Temple. Hukm Chand in the 19th century suggested that the city was named after an ancient Hindu tribe that was named Mul. The Multan region has been continuously inhabited for at least 5,000 years. The region is home to numerous archaeological sites dating to the era of the Early Harappan period of the Indus Valley Civilisation, dating from 3300 BCE until 2800 BCE. According to the Persian historian Firishta, the city was founded by a great grandson of Noah. According to Hindu religious texts, Multan was founded by the Hindu sage Kashyapaand also asserts Multan as the capital of the Trigarta Kingdom ruled by the Katoch dynasty at the time of the Kurukshetra War that is central the Hindu epic poem, the Mahabharata. Ancient Multan was the centre of a solar-worshipping cult that was based at the ancient Multan Sun Temple. While the cult was dedicated to the Hindu Sun God Surya, the cult was influenced by Persian Zoroastrianism. The Sun Temple was mentioned by Greek Admiral Skylax, who passed through the area in 515 BCE. The temple is also mentioned in the 400s BCE by the Greek historian, Herodotus. Multan is believed to have been the Malli capital that was conquered by Alexander the Great in 326 BCE as part of the Mallian Campaign. During the siege of the city's citadel, Alexander leaped into the inner area of the citadel, where he killed the Mallians' leader. Alexander was wounded by an arrow that had penetrated his lung, leaving him severely injured. During Alexander's era, Multan was located on an island in the Ravi river, which has since shifted course numerous times throughout the centuries. In the mid-5th century CE, the city was attacked by a group of Hephthalite nomads led by Toramana. By the mid 600s CE, Multan had been conquered by the Chach of Alor, of the Hindu Rai dynasty. After his conquest of Sindh, Muhammad bin Qasim in 712 CE captured Multan from the local ruler Chach of Alor following a two-month siege. Muhammad bin Qasim's army was running out of supplies, but Multan's defences were still holding strong. His army was considering a retreat when an unnamed Multani came to him and told him about and underground canal from which they derived their sustenance. He told them that if Muhammad's army were to block that canal, Multan would be under their control. Muhammad bin Qasim blocked the canal and soon took control of Multan. Following bin Qasim's conquest, the city's subjects remained mostly non-Muslim for the next few centuries. By the mid-800s, the Banu Munabbih (also known as the Banu Sama), who claimed descent from the Prophet Muhammad's Quraysh tribe came to rule Multan, and established the Amirate of Banu Munabbih, which ruled for the next century. During this era, the Multan Sun Temple was noted by the 10th century Arab geographer Al-Muqaddasi to have been located in a most populous part of the city. The Hindu temple was noted to have accrued the Muslim rulers large tax revenues, by some accounts up to 30% of the state's revenues. During this time, the city's Arabic nickname was Faraj Bayt al-Dhahab, ("Frontier House of Gold"), reflecting the importance of the temple to the city's economy. The 10th century Arab historian Al-Masudi noted Multan as the city where Central Asian caravans from Islamic Khorasan would assemble. The 10th century Persian geographer Estakhri noted that the city of Multan was approximately half the size of Sindh's Mansura, which along with Multan were the only two Arab principalities in South Asia. Arabic and Punjabi were spoken in both cities, though the inhabitants of Multan were reported by Estakhri to also have been speakers of Persian, reflecting the importance of trade with Khorasan. Polyglossia rendered Multani merchants culturally well-suited for trade with the Islamic world. The 10th century Hudud al-'Alam notes that Multan's rulers were also in control of Lahore, though that city was then lost to the Hindu Shahi Empire. During the 10th century, Multan's rulers resided at a camp outside of the city named Jandrawār, and would enter Multan once a week on the back of an elephant for Friday prayers. By the mid 10th century, Multan had come under the influence of the Qarmatian Ismailis. The Qarmatians had been expelled from Egypt and Iraq following their defeat at the hands of the Abbasids there. Qarmatians zealots had famously sacked Mecca, and outraged the Muslim world with their theft and ransom of the Kaaba's Black Stone, and desecration of the Zamzam Well with corpses during the Hajj season of 930 CE. They wrested control of the city from the pro-Abbasid Amirate of Banu Munabbih, and established the Amirate of Multan, while pledging allegiance to the Ismaili Fatimid Dynasty based in Cairo. The Qarmatian Ismailis opposed Hindu pilgrims worshipping the sun, and destroyed the Sun Temple and smashed its revered Aditya idol in the late 10th century. The Qarmatians built an Ismaili congregational mosque atop to the ruins to replace the city's Sunni congregational mosque that had been established by the city's early rulers. Mahmud of Ghazni in 1005 led an expedition against Multan's Qarmatian ruler Abdul Fateh Daud. The city was surrendered, and Fateh Daud was permitted to retain control over the city with the condition that he adhere to Sunnism. In 1007, Mahmud led an expedition to Multan against his former minister and Hindu convert, Niwasa Khan, who had renounced Islam and attempted to establish control of the region in collusion with Abdul Fateh Daud of Multan. In 1010, Mahmud led a punitive expedition against Daud to depose and imprison him, and suppressed Ismailism in favour of the Sunni creed. He destroyed the Ismaili congregational mosque that had been built atop the ruins of the Multan Sun Temple, and restored the city's old Sunni congregational mosque. The 11th century scholar Abu Mansur al-Baghdadi reported that thousands of Ismailis were killed or mutilated during Mahmud's invasion, though the community was not extinguished. Mahmud's rule over the region was noted by Al-Biruni to have ruined the region's former prosperity. Following the Ghaznavid invasion of Multan, the local Ismaili community split, with one faction aligning themselves with the Druze religion, which today survives in Lebanon, Syria, and the Golan Heights. Following Mahmud's death, the city regained its independence from the Ghaznavid empire and came under the sway of Ismaili rule once again. By the early 1100s, Multan was described by the Arab geographer Muhammad al-Idrisi as being a "large city" commanded by a citadel that was surrounded by a moat. In the early 12th century, Multani poet Abdul Rahman penned the Sandesh Rasak, the only known Muslim work in the medieval Apabhraṃśa language. In 1175, Muhammad Ghori conquered Ismaili-ruled Multan, after having invaded the region via the Gomal Pass from Afghanistan into Punjab, and used the city as a springboard for his unsuccessful campaign into Gujarat in 1178. Multan was then annexed to the Ghurid Sultanate, and became an administrative province of the Delhi's Mamluk Dynasty — the first dynasty of the Delhi Sultanate. Multan's Ismaili community rose up in an unsuccessful rebellion against the Ghurids later in 1175. According to Shah Gardez, the second invasion of Multan lead to the extinguishment of the remnants of Ismailism in the region. Following the death of the Mumluk Sultan, Qutb al-Din Aibak in 1210, Multan came under the rule of Nasiruddin Qabacha, who in 1222, successfully repulsed an attempted invasion by Sultan Jalal ad-Din Mingburnu of the Khwarazmian Empire, whose origins were rooted in Konye-Urgench in modern-day Turkmenistan. Qabacha also repulsed a 40-day siege imposed on the city by Mongol forces who attempted to conquer the city. Following Qabacha's death that same year, the Turkic king Iltutmish captured and then annexed Multan in an expedition. The Punjabi poet Baba Farid was born in the village of Khatwal near Multan in the 1200s. Mongols again attempted to invade Multan in 1236, and again in 1241 after capturing Lahore, though they were repulsed. Mongols held the city to ransom in 1246, and the city fell to the Qarlughids that year until 1249 when it was captured by Sher Khan. Multan was then conquered by Izz al-Din Balban Kashlu Khan in 1254, before he rebelled against Sultan Ghiyas ud din Balban in 1257 and fled to Iraq where he joined Mongol forces and captured Multan again, and dismantled its city walls. The Mongols again attempted an invasion in 1279, but were dealt a decisive defeat. Multan's Tomb of Shah Rukn-e-Alam is considered to be the earliest Tughluq-era monument. In the 1320s Multan was conquered by Ghiyath al-Din Tughluq, founder of the Turkic Tughluq dynasty, the third dynasty of the Delhi Sultanate. The countryside around Multan was recorded to have been devastated by excessively high taxes imposed during the reign of Ghiyath's son, Muhammad Tughluq. In 1328, the Governor of Multan, Kishlu Khan, rose in rebellion against Muhammad Tughluq, but was quickly defeated. The Tomb of Shah Rukn-e-Alam was completed during the Tughluq era, and is considered to be the first Tughluq monument. The shrine is believed to have been originally built to be the tomb of Ghiyath ad-Din, but was later donated to the descendants of Rukn-e-Alam after Ghiyath became Emperor of Delhi. The renowned Arab explorer Ibn Battuta visited Multan in the 1300s during the reign of Muhammad Tughluq, and noted that Multan was a trading centre for horses imported from as far away as the Russian Steppe. Multan had also been noted to be a centre for slave-trade, though slavery was banned in the late 1300s by Muhammad Tughluq's son, Firuz Shah Tughlaq. In 1397, Multan was besieged by Tamerlane's grandson Pir Muhammad. Pir Muhammad's forces captured the city in 1398 following the conclusion of the 6 month-long siege. Also in 1398, the elder Tamerlane and Multan's Governor Khizr Khan together sacked Delhi. The sack of Delhi lead to major disruptions of the Sultanate's central governing structure. In 1414, Multan's Khizr Khan captured Delhi from Daulat Khan Lodi, and established the short-lived Sayyid dynasty — the fourth dynasty of the Delhi Sultanate. Multan then passed to the Langah, who established the Langah Sultanate in Multan under the rule of Budhan Khan, who assumed the title Mahmud Shah. The reign of Shah Husayn, grandson of Mahmud Shah, who ruled from 1469-1498 is considered to most illustrious of the Langah Sultans. Multan experienced prosperity during this time, and a large number of Baloch settlers arrived in the city at the invitation of Shah Husayn. The Sultanate's borders stretched encompassed the neighbouring regions surrounding the cities of Chiniot and Shorkot. Shah Husayn successfully repulsed attempted invasion by the Delhi Sultans led by Tatar Khan and Barbak Shah. Multan's Langah Sultanate came to an end in 1525 when the city was invaded by rulers of the Arghun dynasty, who were either ethnic Mongols, or of Turkic or Turco-Mongol extraction. In 1541, the Pashtun king Sher Shah Suri captured Multan, and successfully defended the city from the advances of the Mughal Emperor Humayun. In 1543, Sher Shah Suri expelled Baloch rebels, who under the command of Fath Khan Jat had overrun the city. Following its recapture, Sher Shah Suri ordered construction of a road between Lahore and Multan in order to connect Multan to his massive Grand Trunk Road project. Multan then served as the starting point for trade caravans from medieval India departing towards West Asia. The 15th century Multani caravanserai in Baku, Azerbaijan, was built to house visiting Multani merchants in the city. Multan served as medieval Islamic India's trans-regional mercantile centre for trade with the Islamic world. It rose as an important trading and mercantile centre in the setting of political stability offered by the Delhi Sultanate, the Lodis, and Mughals. The renowned Arab explorer Ibn Battuta visited Multan in the 1300s during the reign of Muhammad Tughluq, and noted that Multan was a trading centre for horses imported from as far away as the Russian Steppe. Multan had also been noted to be a centre for slave-trade, though slavery was banned in the late 1300s by Muhammad Tughluq's son, Firuz Shah Tughlaq. The extent of Multan's influence is also reflected in the construction of the Multani caravanserai in Baku, Azerbaijan — which was built in the 15th to house Multani merchants visiting the city. Legal records from the Uzbek city of Bukhara note that Multani merchants settled and owned land in the city in the late 1550s. Multan would remain an important trading centre until the city was ravaged by repeated invasions in the 18th and 19th centuries in the post-Mughal era. Many of Multan's merchants then migrated to Shikarpur in Sindh, and were found throughout Central Asia up until the 19th century. Following the conquest of Upper Sindh by the Mughal Emperor Akbar, Multan was attacked and captured by Akbar's army under the command of Bairam Khan in 1557, thereby re-establishing Mughal rule in Multan. In 1627, Multan was encircled by walls that were built on the order of Murad Baksh, son of Shah Jahan. Upon his return from an expedition to Balkh in 1648, the future emperor Aurangzeb was appointed Governor of Multan and Sindh — a post he held until 1652. In the second half of the 17th century, Multan's commercial fortunes were adversely affected by silting and shifting of the nearby river, which denied traders vital trade access to the Arabian Sea. Multan witnessed difficult times as the Mughal Empire waned in power following the death of Emperor Aurangzeb in 1707. Under Mughal rule, Multan enjoyed 200 years of peace in a time when the city became known as Dar al-Aman ("Abode of Peace"). During the Mughal era, Multan was an important centre of agricultural production and manufacturing of cotton textiles. Multan was a centre for currency minting, as well as tile-making during the Mughal era. Multan was also host to the offices of many commercial enterprises during the Mughal era, even in times when the Mughals were in control of the even more coveted city of Kandahar, given the unstable political situation resulting from frequent contestation of Kandadar with the Persian Safavid Empire. Nader Shah conquered the region as part of his invasion of the Mughal Empire in 1739. Despite invasion, Multan remained northwest India's premier commercial centre throughout most of the 18th century. In 1752 Ahmad Shah Durrani captured Multan, and the city's walls were rebuilt in 1756 by Nawab Ali Mohammad Khan Khakwani, who also built the Ali Muhammad Khan Mosque in 1757. In 1758, the Marathas under Raghunathrao briefly seized Multan, though the city was recaptured by Durrani in 1760. After repeated invasions following the collapse of the Mughal Empire, Multan was reduced from being one of the world's most important early-modern commercial centres, to a regional trading town. In 1772, Ahmed Shah Durrani's son Timur Shah lost Multan to Sikh forces. However, Multan's association with Sikhism predates this, as the founder of the Sikh religion, Guru Nanak, is said to have visited the city during one of his journeys. The city had reverted to Afghan rule under the suzerainty of Nawab Muzaffar Khan in 1778. In 1817, Ranjit Singh sent a body of troops to Multan under the command of Diwan Bhiwani Das to receive from Nawab Muzaffar Khan the tribute he owed to the Sikh Darbar. In 1818, the armies of Kharak Singh and Misr Diwan Chand lay around Multan without making much initial headway, until Ranjit Singh dispatched the massive Zamzama cannon, which quickly led to disintegration of the Multan's defences. Misr Diwan Chand led Sikh armies to a decisive victory over Muzaffar Khan. Muzzafar Khan and seven of his sons were killed before the Multan fort finally fell on 2 March 1818 in the Battle of Multan. The conquest of Multan established Ranjit Singh's superiority over the Afghans and ended their influence in this part of the Punjab. Diwan Sawan Mal Chopra was appointed to govern the city, remaining in his post for the following 25 years. Following the Sikh conquest, Multan declined in importance as a trading post, however the population of Multan rose from approximately 40,000 in 1827 to 60,000 by 1831. Sawan Mal adopted a policy of low taxation which generated immense land revenues for the state treasury. Following the death of Ranjit Singh, he ceased paying tribute to a successor and instead maintained alliances of convenience with selected Sikh aristocrats. He was assassinated in 1844, and succeeded by his son Diwan Mulraj Chopra, who unlike his father was seen as a despotic ruler by the local inhabitants. Multan's "Bloody Bastion" was the site of fierce fighting during the Siege of Multan in 1848-49. The 1848 Multan Revolt and subsequent Siege of Multan began on 19 April 1848 when local Sikhs loyal to Diwan Mulraj Chopra murdered two emissaries of the British Raj, Vans Agnew and Lieutenant Anderson. The two British visitors were in Multan to attend a ceremony for Sardar Kahan Singh, who had been selected by the British East India Company to replace Diwan Mulraj Chopra as ruler of Multan. Rebellion engulfed the Multan region under the leadership of Mulraj Chopra and Sher Singh Attariwalla. The Multan Revolt triggered the start of the Second Anglo-Sikh War, during which the sajjada nashin of the Shrine of Bahauddin Zakariya sided with the British to help defeat the Sikh rebels. The revolt eventually resulted in the fall of the Sikh Empire in 1849. Multan's Ghanta Ghar dates from the British colonial period, and was built in the Indo-Saracenic style. By December 1848, the British had captured portions of Multan city's outskirts, and destroyed the Multan Fort while bombarding the city. In January 1849, the British had amassed a force of 12,000 to conquer Multan. On 22 January 1849, the British had breached the walls of the Multan Fort, leading to the surrender of Mulraj and his forces to the British. The British conquest of the Sikh Empire was completed in February 1849, after the British victory at the Battle of Gujrat. Between the 1890s and 1920s, the British laid a vast network of canals in the Multan region, and throughout much of central and southern Punjab province. Thousands of "Canal Towns" and villages were built according to standardized plans throughout the newly irrigated swathes of land. The predominantly Muslim population supported Muslim League and Pakistan Movement. After the independence of Pakistan in 1947, the minority Hindus and Sikhs migrated to India en masse, while some Muslim refugees from the newly independent Republic of India settled in the city. Multan's urban typology is similar to other ancient cities in South Asia, such as Peshawar, Lahore, and Delhi - all of which were founded near a major river, and included an old walled city, as well as a royal citadel. Unlike those cities, Multan has lost its royal citadel, as it was largely destroyed by the British in 1848, which negatively impacted the urban fabric of the city. Multan's old neighbourhood homes exemplify Muslim concerns regarding privacy, and defense against the city's harsh climate. The urban morphology is characterized by small and private cul-de-sacs branching off of bazaars and larger arteries. A distinct Multani style of architecture began taking root in the 14th century with the establishment of funerary monuments, and is characterized by large brick walls reinforced by wooden anchors, with inward sloping roofs. Funerary architecture is also reflected in the city's residential quarters, which borrow architectural and decorative elements from Multan's mausolea. Multan is located in Punjab, and covers an area of 133 square kilometres (51 sq mi). The nearest major cities are Dera Ghazi Khan and Bahawalpur. Multan is located in a bend created by five rivers of central Pakistan. The Sutlej River separates it from Bahawalpur and the Chenab River from Muzaffar Garh. The area around the city is a flat, alluvial plain that is used for citrus and mango farms. Multan features an arid climate (Köppen climate classification BWh) with very hot summers and mild winters. The average annual precipitations 186 millimetres (7.3 in). Multan is known for having some of the hottest weather in the Pakistan. The highest recorded temperature is approximately 52 °C (126 °F), and the lowest recorded temperature is approximately −1 °C (30 °F). Dust storms occur during summer months. Multan's dust storm sometimes produce violent wind. South West Monsoon occurs following the hottest months of the year, and lasts between June and September. Monsoon rains moderate temperatures, and can sometimes produce heavy rain storms. Multan's is home to a significant Christian minority. Multan's Sufi shrines are often decorated during annual Urs festivals. Pictured is the Wali Muhammad Shah shrine. Multan city had a population of 1,197,384 in the 1998 census. As of 2017 census, Multan's population jumped to 1.871 million. Multan is situated along the under-construction 6-lane Karachi–Lahore Motorway connecting southern and northern Pakistan that is being built as part of the $54 billion China Pakistan Economic Corridor. The 6-lane, 392 kilometre long M-5 section of the motorway is being built between Sukkur and Multan at a cost $2.89 billion. The M-5 has been under construction since May 2016. Multan will also be connected to the city of Faisalabad via the M-4 motorway, which in turn will connect to the M-1 and M-2 motorways that will provide access to Islamabad and Peshawar. Further links with the Karakoram Highway will provide access to Xinjiang, China, and Central Asia. Construction of the M3 motorway also under construction at a cost of approximately $1.5 billion, and was launched in November 2015 The motorway will branch off of the M-4 motorway and will connect Lahore to the M-4 at Abdul Hakeem. Multan Cantonment railway station serves as the city's main railway station. Multan is connected by rail with all parts of the country and lies on the main track between Karachi, Peshawar, Lahore and Quetta. The Main Line-1 Railway that links Karachi and Peshaway passes through Multan district is being overhauled as part of the China Pakistan Economic Corridor. As part of the part of the project, railways will be upgraded to permit train travel at speeds of up to 160 kilometres per hour, versus the average 60 to 105 km per hour speed currently possible on existing track, The project is divided into three phases, with the Peshawar to Multan portion to be completed as part of the project's first phase by 2018, and the entire project is expected to be complete by 2021. From Multan, links to Khanewal, Lodhran and Muzafargarh are offered by rail. Multan Cantonment railway station is the main railway station of Multan. The Multan Metrobus is a bus rapid transit line which commenced service in January 2017, at a cost of 28.8 billion rupees. The BRT route serves 21 stations over the course of 18.5 kilometres, of which 12.5 kilometres are elevated. 14 stations are elevated, while the remainder are at street level. The BRT route begins at Bahauddin Zakariya University in northern Multan, and heads southward to pass by the eastern edge of Multan's old city at the Daulat Gate before turning east to finally terminate at the Kumharanwala Chowk in eastern Multan. The route will initially serviced by 35 buses, serving up to 95,000 passengers per day. The Multan Metrobus is planned to ultimately have total of 4 BRT lines covering 68.82 kilometres, which will be complemented by feeder lines. Multan International Airport offers flights throughout Pakistan, and direct flights to Bahrain, Oman, Qatar, Saudi Arabia, and the United Arab Emirates. Multan International Airport is located 10 km west of Multan's city centre, in the Multan Cantonment. The airport offers flights throughout Pakistan, as well as to the Persian Gulf States. In March 2015, a new terminal building was formally inaugurated by Pakistani Prime Minister Nawaz Sharif. Following the opening of the new terminal, passenger traffic soared from 384,571 in 2014-2015, to 904,865 in 2015-2016. The NFC Institute of Engineering and Technology, established as the training center of the National Fertilizer Corporation (NFC) of Pakistan, is a degree awarding engineering and technology institute in Multan, serving mainly the areas of Southern Punjab province. Bahauddin Zakariya University (formerly known as Multan University) is the main source of higher education for this region. Air University Multan Campus is the prominent science and engineering institute in the region. The Swedish Institute of Technology in Multan is a campus of the Swedish Group of Technical Institutes, the largest private-sector organisation providing technical education and vocational training in the Punjab. Nishtar Medical University is a worldwide famous medical university in Multan. It offers many undergraduate and post-graduate programs for medical students. It is also famous for its beautiful and ancient building. Its teaching hospital is Nishtar Hospital Multan, one of the largest hospitals in South Asia. The Institute of Southern Punjab, a private and chartered degree-awarding institution well known for its voguish city campus and streamlined educational program is another notable educational establishment in the city of Multan. Now more universities from federal are also opening campuses in Multan, such as National University of Modern Languages (NUML). The Women University Multan is the first Government Women University offering higher education to the females of Southern Punjab. It was established in 2013. The tomb of Khawaja Awais Kagha displays use of traditional Multan tile-work on both its exterior and interior. Prahladpuri Temple, Multan is located It is located on top of a raised platform inside the Fort of Multan, adjacent to tomb of Hazrat Baha’ul Haq Zakariya. A mosque has subsequently built adjacent to temple. The shrine of Pir Adil Shah. The Multan Cricket Stadium hosted many international cricket matches. Ibn-e-Qasim Bagh Stadium is the other stadium in Multan which is usually used for football along with other sports activities. Multan is home to Multan Tigers, the domestic cricket which represents the city in domestic tournaments and Multan Sultans, the new franchise of Pakistan Super League. Multan has produced many international cricketers like Inzamam-ul-Haq, Sohaib Maqsood, Rahat Ali, and Sania Khan. ^ "POPULATION OF MAJOR CITIES CENSUS - 2017" (PDF). www.pbscensus.gov.pk. Archived from the original (PDF) on 2017-08-29. Retrieved 2018-01-03. ^ Bury, John Bagnell (2015). A History of Greece. Cambridge University Press. p. 810. ISBN 9781108082204. ^ a b c d e f g Levi, Scott (2016). "Caravans: Punjabi Khatri Merchants on the Silk Road". Penguin UK. Retrieved 12 April 2017. ^ Wink, André (2002). Al-Hind, the Making of the Indo-Islamic World: Early Medieval India and the Expansion of Islam 7Th-11th Centuries. BRILL. ISBN 9780391041738. ^ Moir, Zawahir; Shackle, Christopher (2013). Ismaili Hymns from South Asia: An Introduction to the Ginans. Routledge. p. 186. ISBN 9781136822841. The name of the actual city of Multan derives from the same Sanskrit word (Sk mūlasthāna-). ^ Multān City - Imperial Gazetteer of India, v. 18, p. 35. ^ a b c d e Calcutta Review, Volumes 92-93. University of Calcutta. 1891. ^ Khan, Ahmad Nabi (1983). Multan: history and architecture. Institute of Islamic History, Culture & Civilization, Islamic University. ^ a b Ghose, Sanujit (2004). Legend of Ram: Antiquity to Janmabhumi Debate. Bibliophile South Asia. ISBN 9788185002330. ^ Sinha, Amita; Silva, Kapila D. (2016). Cultural Landscapes of South Asia: Studies in Heritage Conservation and Management. Taylor & Francis. ISBN 9781317365938. Retrieved 14 September 2017. ^ Charak, Sukh Dev Singh (1978). Himachal Pradesh, Volume 1. Light & Life Publishers. ^ Hutchison, John (1933). History of the Panjab Hill States, Volume 1. Asian Educational Services. ISBN 9788120609426. ^ a b c d e f g h MacLean, Derryl N. (1989). Religion and Society in Arab Sind. BRILL. ISBN 9789004085510. ^ Islamic culture, Volume 43. Islamic culture Board. 1963. p. 14. ^ Dave, Wood. "In the footsteps of Alexander the Great". The City of Multan. BBC. Retrieved July 14, 2011. ^ Dodge, Theodore (1890). Alexander. New York: Da Capo Press. p. 604. ^ Cunningham, Alexander (1871). The Ancient Geography of India: The Buddhist Period, Including the Campaigns of Alexander, and the Travels of Hwen-Thsang. Cambridge University Press. ISBN 9781108056458. ^ Majumdar, Ramesh Chandra (1977). Ancient India. Motilal Banarsidass Publ. ISBN 9788120804364. ^ a b c d e f g Flood, Finbarr Barry (2009). Objects of Translation: Material Culture and Medieval "Hindu-Muslim" Encounter. Princeton University Press. ISBN 9780691125947. ^ a b c d e f g h i j k Rafiq, A.Q. ; Baloch, N.A. THE REGIONS OF SIND, BALUCHISTAN, MULTAN AND KASHMIR: THE HISTORICAL, SOCIAL AND ECONOMIC SETTING (PDF). UNESCO. ISBN 978-92-3-103467-1. ^ a b c d e f g h i j k l Habib, Irfan (2011). Economic History of Medieval India, 1200-1500. Pearson Education India. ISBN 9788131727911. ^ a b Osimi, Muhammad. History of Civilizations of Central Asia (vol.4, part-1). Motilal Banarsidass, 1992. ISBN 9788120815957. ^ Strand, Elin; Marsh, Adrian; Paul Polansky (2006). Gypsies and the Problem of Identities: Contextual, Constructed and Contested. Swedish Research Institute in Istanbul. ISBN 9789186884178. ^ a b c d e f g Mehta, Jaswant Lal (1980). Advanced Study in the History of Medieval India, Volume 1. Sterling Publishers Pvt Ltd. ISBN 9788120706170. ^ Virani, Shafique N. The Ismailis in the Middle Ages: A History of Survival, A Search for Salvation (New York: Oxford University Press), p. 100. ^ a b c d e f g h i Ahmed, Farooqui Salma (2011). A Comprehensive History of Medieval India: Twelfth to the Mid-Eighteenth Century. Pearson Education India. ISBN 9788131732021. ^ Jain, Harish. The Making of Punjab. Unistar Books, 2003. ^ a b c d Imperial gazetteer of India: provincial series. Supt. of Govt. Print. 1908. ^ a b Bloom, Jonathan (1995). The Art and Architecture of Islam 1250-1800. Yale University Press. ISBN 9780300064650. Retrieved 9 September 2017. ^ Suvorova, Anna (2004). Muslim Saints of South Asia: The Eleventh to Fifteenth Centuries. Routledge. ISBN 9781134370054. ^ Khan, Hassan Ali (2016). Constructing Islam on the Indus: The Material History of the Suhrawardi Sufi Order, 1200–1500 AD. Cambridge University Press. ISBN 9781316827222. ^ Bunce, Fredrick W. (2004). Islamic Tombs in India: The Iconography and Genesis of Their Design. D.K. Printworld. ISBN 9788124602454. ^ a b c d Chandra, Chandra (2005). Medieval India: From Sultanat to the Mughals Part - II. Har-Anand Publications. ISBN 9788124110669. ^ a b Amity, Volumes 1-3. Indo-Soviet Cultural Society. 1963. p. 135. Retrieved 12 April 2017. ^ Beck, Sanderson. "Mughal Conquest of India 1526–56". INDIA & Southeast Asia to 1800. Retrieved 11 June 2009. ^ a b c d e f g h Oonk, Gijsbert (2007). Global Indian Diasporas: Exploring Trajectories of Migration and Theory. Amsterdam University Press. p. 294. ISBN 9789053560358. ^ Chaudhry, Nazir Ahmad (2002). Multan Glimpses: With an Account of Siege and Surrender. Sang-e-Meel Publications. ISBN 9789693513516. Retrieved 9 September 2017. ^ "Dictionary of Battles and Sieges: A-E". Retrieved 29 December 2014. ^ Nikky-Guninder, Kaur Singh (2011). Sikhism: An Introduction. I.B.Tauris. ISBN 9780857735492. ^ Anand, Anita (2015). Sophia: Princess, Suffragette, Revolutionary. Bloomsbury Publishing. ISBN 9781408835463. ^ Singh, Khushwant (2008). Ranjit Singh. Penguin Books India. ISBN 9780143065432. ^ Dictionary of Battles and Sieges: F-O – Tony Jaques – Google Books. Books.google.co.in. Retrieved 11 August 2012. ^ Ranjit Singh: And the Sikh Barrier Between British Empire and Central Asia – William Wilson Hunter – Google Books. Books.google.co.in. Retrieved 11 August 2012. ^ a b c d Riddick, John F. (2006). The History of British India: A Chronology. Greenwood Publishing Group. ISBN 9780313322808. ^ a b Bingham, Jane (2008). Sikhism. Black Rabbit Books. ISBN 9781599200590. Retrieved 17 March 2017. ^ Khan, Hussain Ahmad (2014). Artisans, Sufis, Shrines: Colonial Architecture in Nineteenth-Century Punjab. IB Taurus. ISBN 9781784530143. Retrieved 8 September 2017. ^ Grewal, J.S. (1990). The Sikhs of the Punjab. Cambridge University Press. p. 107. ISBN 0 521 63764 3. Retrieved 16 March 2017. ^ a b c d e f g h Bignami, Daniele Fabrizio; Del Bo, Adalberto (2014). Sustainable Social, Economic and Environmental Revitalization in Multan City: A Multidisciplinary Italian–Pakistani Project. Springer Science & Business Media. ISBN 9783319021171. ^ a b Glover, William (2008). Making Lahore Modern: Constructing and Imagining a Colonial City. U of Minnesota Press. ISBN 9781452913384. ^ Arif, Dr. Muhammad (1988). The resurgence of the Muslim ummah and Pakistan movement. Wajidalis. ^ a b "Multan Developemt Authority Official website says 50 Deg Highest". Archived from the original on 26 July 2013. Retrieved 3 April 2013. ^ a b "Doaba Foundation web Link about Climate of Multan". Archived from the original on 10 March 2013. Retrieved 3 April 2013. ^ "Multan Climate Normals 1961–1990". National Oceanic and Atmospheric Administration. Retrieved 16 January 2013. ^ "Population Size and Growth of Major Cities" (PDF). Pakistan Bureau of Statistics, Government of Pakistan. Retrieved 31 August 2015. ^ "1998 tehsils data at the Demobase". Archived from the original on 7 January 2017. Retrieved 10 December 2017. ^ "China's CSCEC to build $2.9bn motorway in Pakistan as part of planned 'corridor'". Global Construction Review. 8 January 2016. Retrieved 16 January 2016. ^ "PAK PM inaugurates Sukkur-Multan highway". Business Standard. 6 May 2016. Retrieved 8 May 2016. ^ Kiani, Khaleeq (16 December 2015). "Two Asian banks to give Rs 29bn for M-4 project". Dawn News. Retrieved 16 December 2015. ^ Samar, Azeem (13 November 2015). "JCC of CPEC decides to enhance capacity of Thar power projects to 2,600MW". The News. Retrieved 6 December 2015. ^ a b "Pakistan to get Chinese funds for upgrading rail links, building pipeline". Hindustan Times. 10 June 2016. Retrieved 9 August 2016. The project is planned to be completed in two phases in five years by 2021. The first phase will be completed by December 2017 and the second by 2021. ^ Transport in Multan Archived 15 July 2010 at the Wayback Machine Lonely Planet Travel Information. Accessed 15 August 2009. ^ "Prime Minister inaugurates Multan Metrobus". Dawn News. Retrieved April 4, 2017. ^ "Metro bus service opened in Multan". Gulf News. 24 January 2017. Retrieved 4 April 2017. ^ a b "Multan Metro Bus in final phase". Pakistan Observer. 5 September 2016. Retrieved 4 April 2017. ^ a b "Tender Document DEVELOPMENT, IMPLEMENTATION, OPERATIONS AND LONGTERM MAINTENANCE OF PROVEN GLOBALLY DEPLOYED AUTOMATED FARE COLLECTION & BUS SCHEDULING SYSTEM (AFC-BSS) FOR MULTAN METROBUS SYSTEM AND FEEDER ROUTES" (PDF). THE PUNJAB MASS TRANSIT AUTHORITY Government of the Punjab. Retrieved 4 April 2017. ^ "Multan Airport opens to the world". Pakistan Today. 2015-03-10. ^ "Home". nfciet.edu.pk. Retrieved 2017-04-23. ^ "NUML Multan Campus - National University of Modern Languages". multan.numl.info. Retrieved 3 May 2017. ^ Muslim Saints of South Asia: The Eleventh to Fifteenth Centuries By Anna Suvorova. p. 153. ^ Gazetteer of the Multan District, 1923-24 Sir Edward Maclagan, Punjab (Pakistan). 1926. pp. 276–77. ^ Imperial rule in Punjab: the conquest and administration of Multan, 1818-1881 by J. Royal Roseberry. pp. 243, 263. ^ All the year round, Volume 51. Charles Dickens. 1883. ^ Jaffery, Owais (2011-06-09). "Sister cities: Multan celebrates Italy's national day". Pakistan: The Express Tribune. ^ "PAKISTAN – TURKEY JOINT STATEMENT" (Press release). Islamabad, Pakistan. Pakistan Ministry of Foreign Affairs. 2008-10-31. Archived from the original on 2012-02-11. Retrieved 2018-03-30. ^ "Gilani visits land of his forefathers". Bangkok, Thailand: Thaindian News. 2011-09-14. ^ Iqbal, Javed (2016-01-16). "China to make new bond with Punjab". The Nation. Pakistan: Nawa-i-Waqt.